Ballymena United's 16-year-old striker Matthew Shevlin has gone on a week-long trial with English Premier League club Crystal Palace. The 'A' level student has become a regular in the Irish Premiership team's attack this season and is being tipped to make it as a full-time professional. 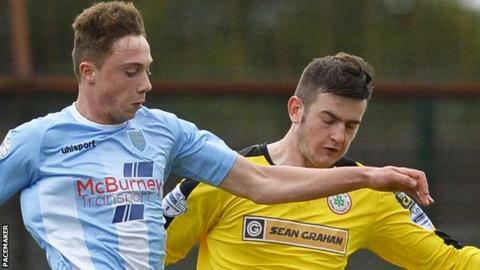 He starred in Ballymena's remarkable 6-1 win over Cliftonville last Saturday. "We have had a lot of enquiries about him from cross-channel clubs," said United team manager Glenn Ferguson. "We are trying to manage it as best we can. "Matthew is a level-headed lad and his feet will stay in the ground. "He has a bright future and we will certainly not stand in his way. "He is in our first team at 16 years of age and he is playing like a 25-year-old. "If he keeps doing what he has been doing, he will go in the right direction."